FrameMaker is a master at generating lists. You can quickly create a chronologic list of headings with page numbers (AKA a table of contents), or a chronologic list of TableTitles (AKA a list of tables) or an alphabetized list like an index. 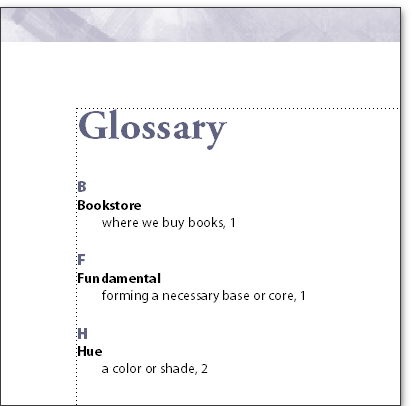 A glossary list is just an alphabetized index of terms with their accompanying definitions, and is a terrific asset to any technical manual that uses terms that your audience may not know when they open your manual for the first time. Select a term that you would like to add to your glossary. In this example, I am selecting the word “Hue”. Choose Special > Marker. The selected word will appear automatically in the Marker panel. Change the marker type to Glossary (on the top row). Then add a colon and the definition after the term. (The colon serves to separate the term from its definition.) Click the New Marker button. Repeat this process for all of the terms you would like to add to your glossary. When you are ready to generate the glossary, select the last file in your book window. 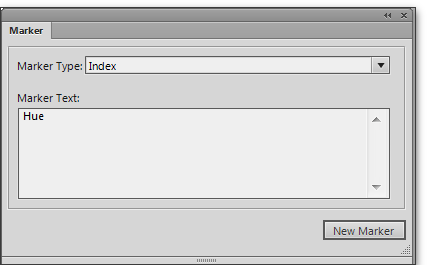 Choose Add > Index of > Markers. Use the left-pointing arrow to move Glossary from the Don’t Include list on the right to the Include Markers of Type list on the left. Click Add. 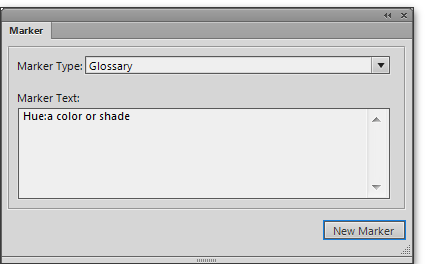 FrameMaker generates the glossary. From this point on, treat this file like any other generated index. You can add the title to the top of the page—but don’t forget to name the title with a paragraph tag that doesn’t end with the suffix for the generated file (in this case, IOM) or it will disappear when you update your book. 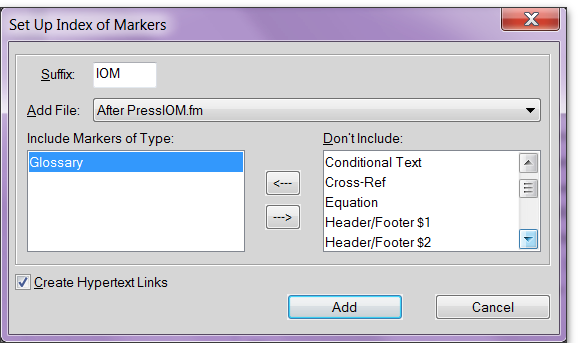 Use the Paragraph Designer to format the title, GroupTitlesIOM, Level1IOM and Level2IOM paragraphs. Use the Reference Pages to control the presentation, including resizing those pesky page numbers after you update your book. Hope you still check messages for this (as it is quite old). Question – Am I correct in assuming that the index created for a glossary, should show the pages for all instances that a term is used? But I’m not clear on your question. An index should page page numbers, a glossary normally does not—remove the < $pagenum> building block from the reference page—thought it defaults to having them. But it sounds like you want to create an index for the glossary?